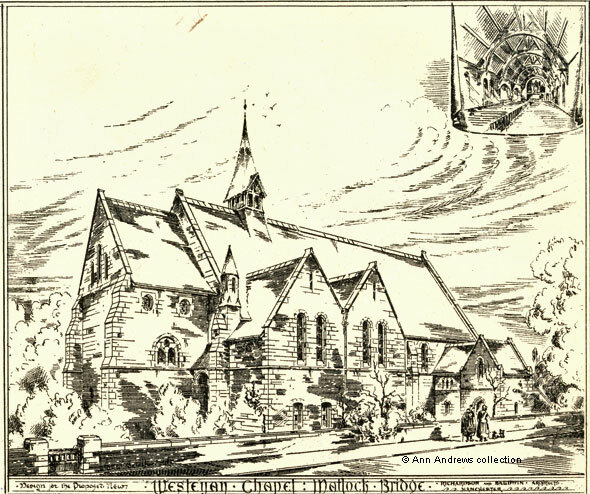 In the late 1870s the Wesleyan Chapel on Snitterton Road (Smithy Lane), built in 1840, was to be replaced by a larger an more up-to-date church on Matlock Bank (Matlock Bridge on the drawings) and this design for the proposed new chapel was published in "The British Architect" on 28th February 1879. The Bank Road church opened for worship in 1882. The image above shows the whole design and each section is enlarged below, presented as top row left to right (two drawings) followed by bottom row left to right (three drawings). 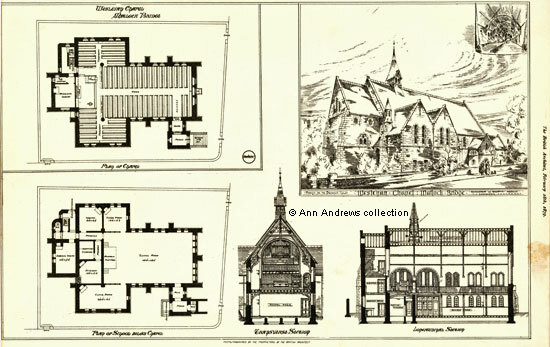 The church was designed with frontages on both Oak Road and Bank Road, with Oak Road where the words "Plan for Chapel" are in the above drawing. Bank Road is on the right hand side of the plan. The body of the chapel was to consist of a nave with two transepts close to the area of the communion table, pulpit and font. The seating was to include several hinged seats, to allow for additional worshippers. 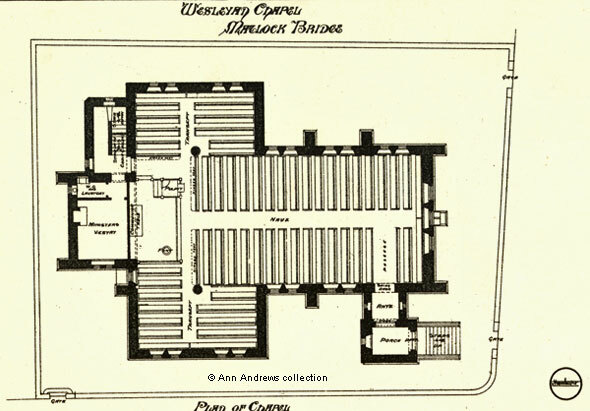 At the north west end was a passage between the seats that lead to an ante room and porch, with steps down. A Minister's Vestry, with its own toilet (water closet and lavatory) was planned for the area behind the altar/communion table and to the side was a door leading to steps up to a choir gallery and steps down to the schoolroom. Bottom right on the plan is a circle with the word Manchester inside it; the architects for this plan came from Manchester. Richardson and Baldwin Architects, Manchester. Plan of School Below Chapel (bottom row, left). The girls entrance was in the south east corner, whilst the boys were to enter the schoolroom from the north west. Transverse section (bottom row, centre). 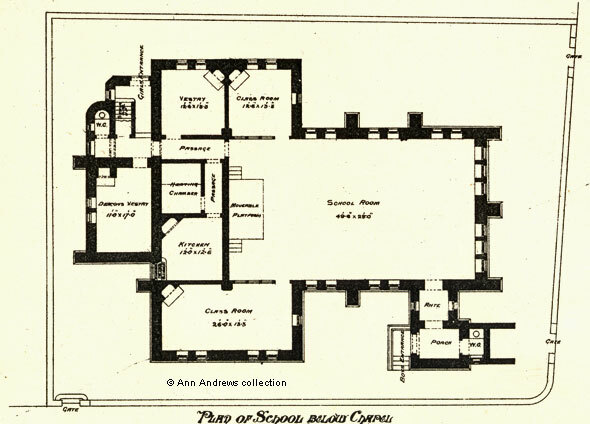 The transverse section shows the school room beneath the area designated for worship. Longitudinal Section (bottom row, right). The lower floor was to be made up of, from the left on the Longitudinal Section: a Deacon's Vestry, a Heating Chamber and the School Room, some 12 feet in height between the floor and the floor above it. 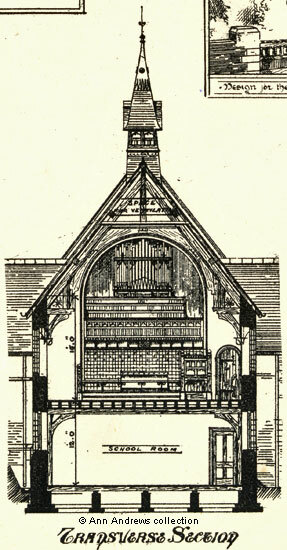 The ground floor included, from the left on the Longitudinal Section: a Minister's Vestry with an Organ and choir stalls above it and the main body of the church. This was 25 feet high from floor to ceiling. Above the church was an area for ventilation, topped by a ventilation shaft. The two architects were William Richardson and his partner William Wallis Baldwin, both of whom were lodging in Chorlton upon Medlock at the time of the 1881 census. "Design for the Proposed New Wesleyan Chapel : Matlock Bridge". 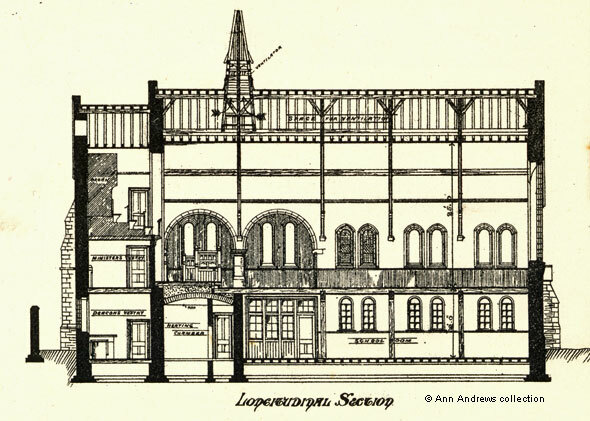 The British Architect, 28th Feb, 1879. Partnership details from: "Directory of British Architects", 1834-1914: Vol. 2 edited by Antonia Brodie, British Architectural Library, Royal Institute of British Architects. At the time of the 1871 census William Richardson was living at 48, India Street, St Stephen, Edinburgh. He was born in 1848 in Galashiels, Selkirkshire and was then described as an Architectural Draughtsman. In 1881 he lodged at 159, Lloyd Street, Chorlton upon Medlock and described himself as an architect. William Wallis Baldwin was born in Birkenhead in 1851. He was in Tranmere with his parents in 1871, but in 1881 he and his Scottish born wife, Agnes Murray Baldwin, were 159, Lloyd Street, Chorlton upon Medlock. From May 1881 from May 1881 he entered into a partnership with Thomas Muirhead as Muirhead & Baldwin, with an office in King Street, Manchester.